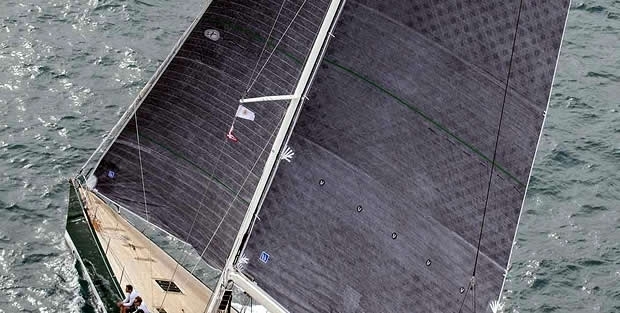 In December, following testing on several IMOCA 60s as well as the Wally 77, Genie of the Lamp, French sailmaker Incidence formally unveiled its new filament-based membrane, DFi, which it claims as being "robust, stable and lightweight".Two years ago Incidence Technologies set up its own integrated design department, focussed on the production and development of its own membranes. With this ability to analyse, test and produce, Incidence is now the master of the entire process of the design and the production of its sails: from R & D to the finishing. The benefits of this have been enormous, enabling to offer DFi, after two years of development. DFi, Incidence claims, offers "unprecedented durability to sails and excellent stability of form. Additionally, this material, free of a Mylar film or taffeta, is incredibly light." This membrane comprises pre-impregnated composite strips laid out along very precise but non-parallel lines in order to withstand, in the most efficient manner, the primary and secondary loads exerted on a sail while it is in use. The pre-impregnated strips are laid and laminated on a marble table. On this they are then vacuum bagged and compressed with heat under more than six bars of pressure, and then bonded with a recyclable, solvent-free thermoplastic resin. As with Incidence's D4 Premium fabric, the membrane is manufactured in a single operation. It is then shaped on the floors of the Incidence sail lofts. Yann Eliès' IMOCA 60 Queguiner-Leucémie Espoir used a DFi mainsail, when it finished third in the recent Transat Jacques Vabre: “I’m really very happy with this sail, particularly for its lightness and the stability of shape,” he said. A DFi J2 is currently being trialled on Paul Meilhat's SMA. In December, DFi was awarded the 2015 prize for High Technology by France's Nautical Industries Federation. Yannick Richomme, development director of Incidence Sails added: “We would like to thank the FIN and the jury of the High Technology prize. We are very proud of this award. DFi is Incidence’s filamentary solution which has come from the development of our D4 membrane. It is characterised by its lightness, its strength and high stability of form. This development is the result of the work of a multidisciplinary team. "We launched DFi at the Paris Boat Show after an intensive validation programme: technical, legal, and also our ability to produce the quality required fast enough to be economic. The final process, a full-scale sailing test, took place during the last Transat Jacques Vabre, where three boats were equipped with DFi sails. This test proved to be very convincing because of the weather conditions encountered and a podium finish in the IMOCA class. "Thank you again for this recognition, which for an innovative French SME, is an encouragement to keep going." Maxime Paul is returning to the design office in La Rochelle. After competing in the Olympics, he worked for Franck Cammas’s team and several sailmakers including Incidence. His expertise will be invaluable. Vanessa Paul joins the commercial department, Brice Turban strengthens the R & D team at Incidence Technologies.